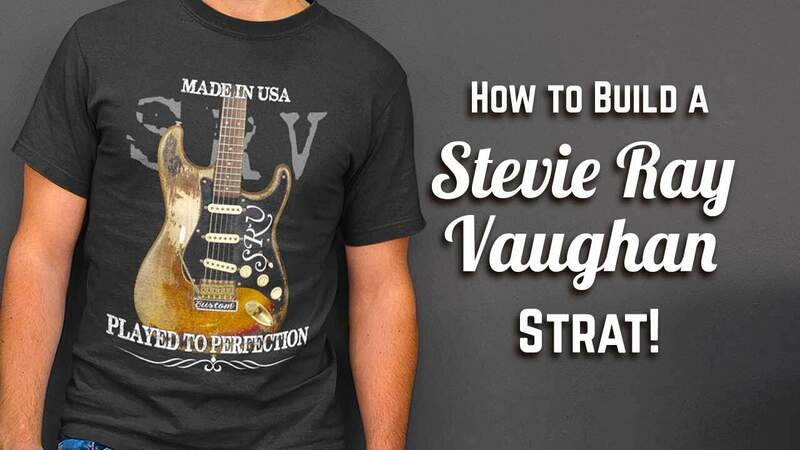 Home » Guitar Tutorials & Resources » Guitar Setup & Repair Articles » How to Build a Stevie Ray Vaughan Number One Strat! 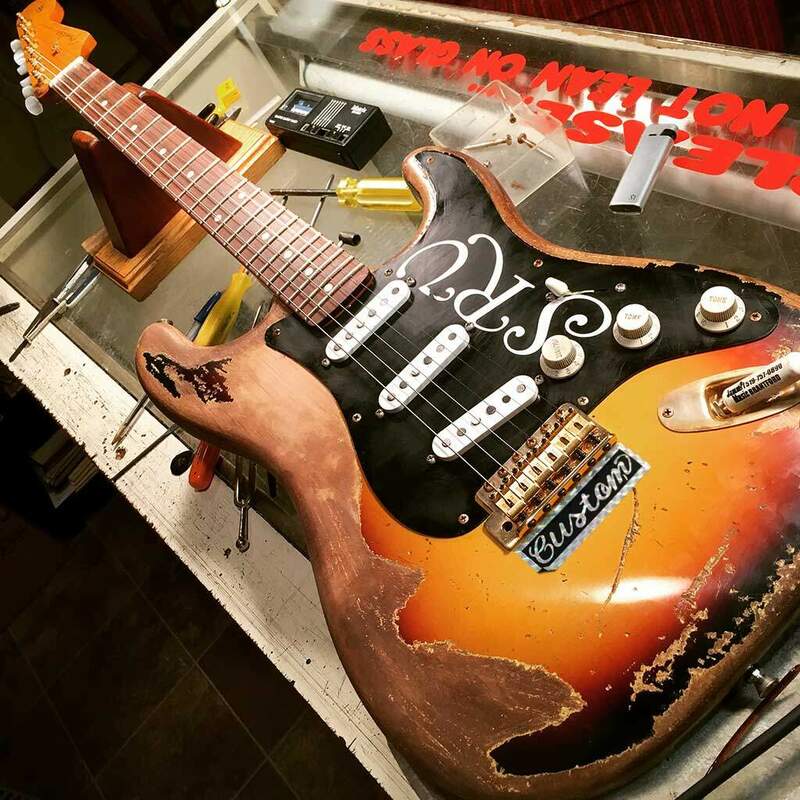 In this step-by-step tutorial, you’ll learn how to put together one of the most recognizable and iconic guitars to ever grace the stage – Stevie Ray Vaughan’s Number One Strat. 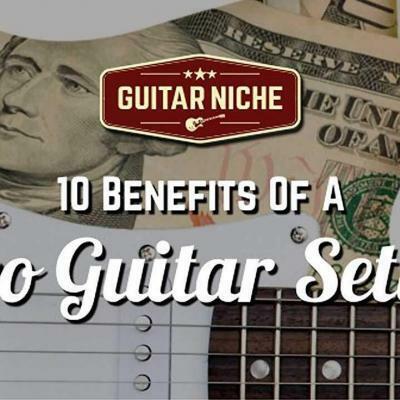 You’ll also learn some of the tricks of the trade that help you achieve superior results, and guarantee a fantastic playing instrument. This particular build was requested by a very good customer of mine, Ryan B., who supplied all the necessary goodies. As for the build process, I’ve listed the steps in point form wherever possible to keep things moving along. First priority on this SRV guitar is attaching the neck. This will give us a read on the basic geometry and provide stability on the workbench. 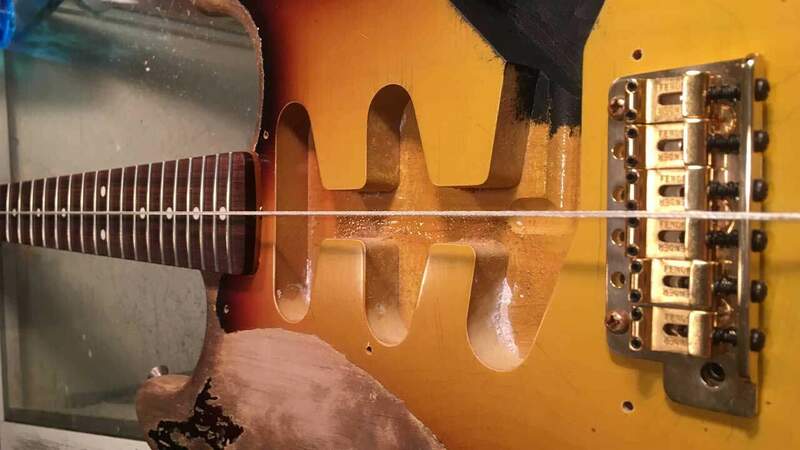 The entire structure of the build will hinge on how well the neck marries with the body; from how well the neck sits in the pocket, to it’s lateral and horizontal positions. As I inspected the neck and body, I took note that both pieces were predrilled for the neck bolts. With the two parts being supplied by different manufacturers, this could be an issue. The body and neck holes were checked for alignment. They weren’t perfect but should work fine with right approach. Also noticed the bolts themselves, which the owner had taken the time to treat, were a bit oversize. Using a slightly larger drill bit, the body holes were then widened to make sure the bolts wouldn’t bind. 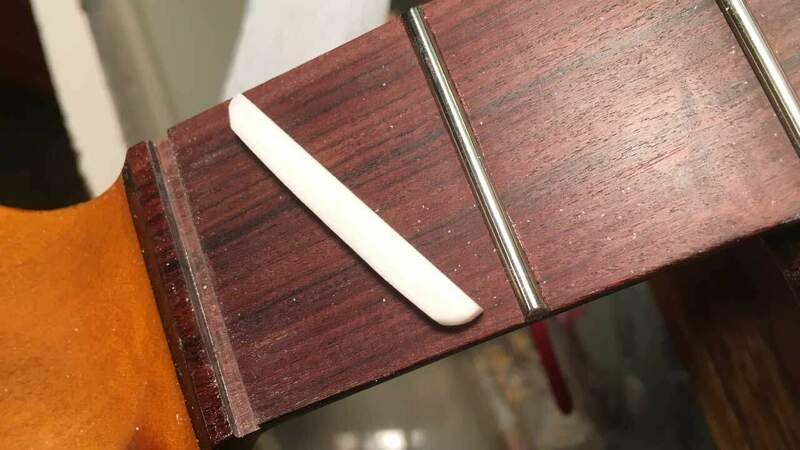 Checked the truss rod adjuster for smoothness and operation, then tightened it using moderate pressure – just enough to feel positive friction. Installed 2 neck bolts temporarily, just enough to bite and stabilize to get things started. Measured combined body & neck bolt depth. Marked that depth on drill bit with tape. Primed the remaining 2 holes by pre-drilling. Applied wax to the bolts to help them seat and seal. Installed the 2 remaining bolts with firm pressure. Removed first 2 bolts and primed those holes. NOTE: The last 2 bolts will not be reinstalled until later on to allow for adjustments without compromise. 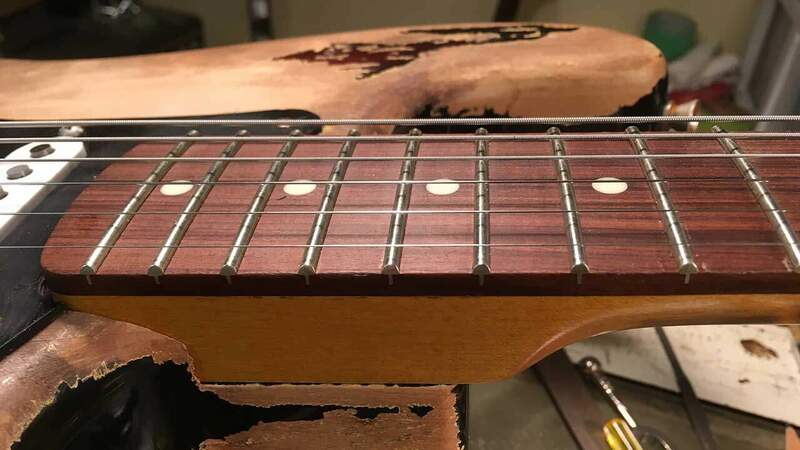 Before we move forward, we need the bridge in place to check neck alignment. 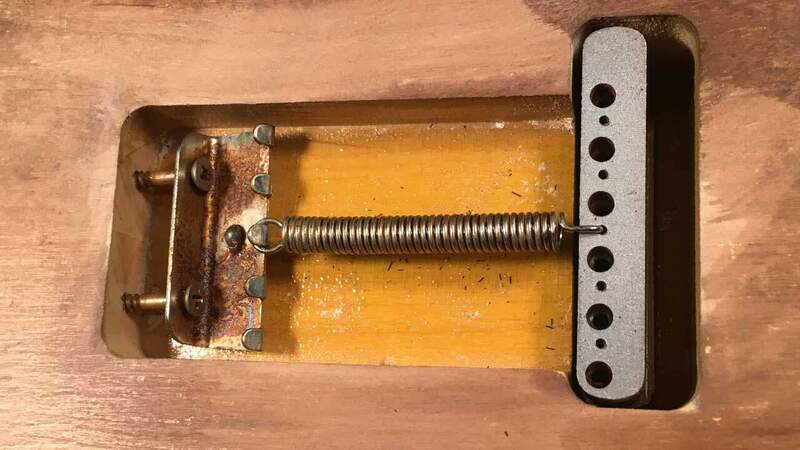 And before we can install the bridge, we need to turn our attention to the spring cavity. Marked out the claw plate screw positions using the plate centred to the back wall of the cavity. Used a 1/8″ aircraft bit marked to depth to drill out screw the holes. Waxed the screws and installed the claw plate. Checked for overall alignment – good to go! Temporarily installed the bridge using the outer two bridge plate screws. The bridge on this instrument will ultimately be set up non-floating or hard-tailed as per the client’s preference. Installed one trem spring in the back to keep the bridge flush to the body. Tied a piece of thin white string to the third tuner and stretched it over the centre of the bridge (exactly between the third and fourth saddles) to simulate string height and check lateral neck alignment. NOTE: If there’s any sloppiness in the neck joint that will affect this geometry, the extra pressure from installing the last 2 screws will tell the tale. 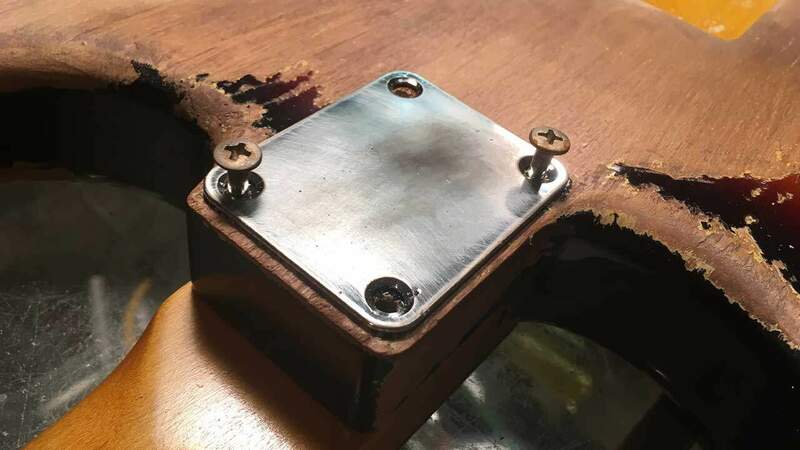 TIP: You can set the bridge plate screw depth by turning the screw in to the point where the back edge of the bridge plate just comes off the body. Then back the screw off 1/4 turn. Double checked the neck bolts to make sure they were tight and that the neck was seated firmly in the pocket. Things can change very quickly once the last two bolts and string compression come into play. Rough cut and dry-fitted a bone nut blank to help with scale length and intonation measurements. Double checked that the scale length was in the ball park by measuring from the forward face of the nut to the crown of the leading edge of the third string saddle. 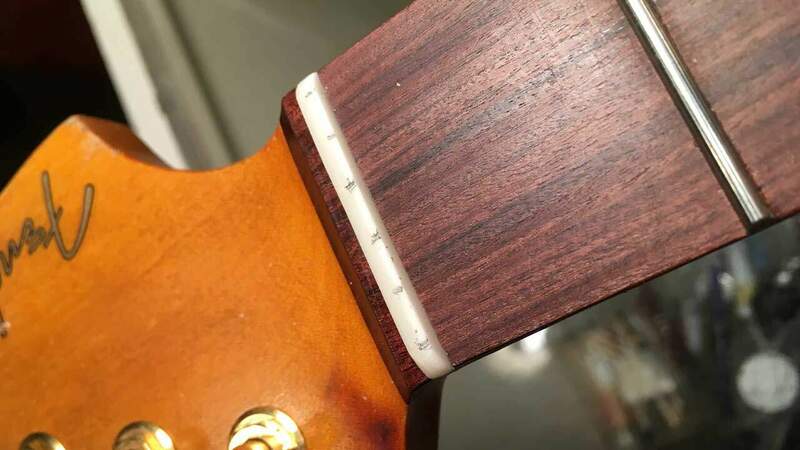 The third string saddle must be close to the midpoint of adjustment capability (intonation screw travel) in order to continue. If not, there are serious underlying issues which will require corrective action. Scale length and adjustability checked good! 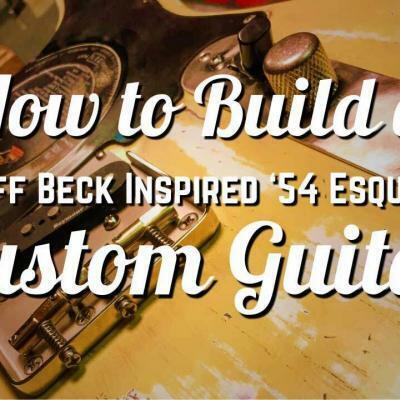 Rough set the intonation using a predicted scale length of 25 9/16″ for the B string and 25 5/8″ for the A string. These preliminary compensations are a matter of experience. See the Electric Guitar Intonation Pattern reference diagram below. The fourth and sixth strings will relate to the A string setting, the third and first strings will likewise relate to the B string setting. Keep in mind we are simply trying to get in the ball park to minimize adjustments later on. Glued the nut using a couple small dabs of carpenter’s glue in the slot. Applied an adjustable Shubb capo using light pressure on the nut for one hour. NOTE: The nut blank was previously fitted to match perfectly flush with the sides of the neck before it was glued in. Personally, I prefer to commit to a set nut early on. This forces me to be hyper-focused on slot cutting and finishing processes. Not for the squeamish for sure, but that’s the benefit of experience. First job is to take stock of the electronics components, their layout, and develope a plan for installation. The Klein pickups were already clearly marked for their respective positions: neck, mid, and bridge (nice!). Plus the leads were nicely trimmed for length. Installed the pickups starting with the neck position. Installed the pre-wired controls hand tight. Seated the jack in the jackplate making sure it was tight and oriented properly so as not to bind in the cavity or ground out. At this point the electronics are essentially done. Still, I would rather only have to remove four screws, rather than the full monty, should there be a problem later on. Knowing the controls are working properly, I used an open end wrench to tighten up the outer pot nuts. 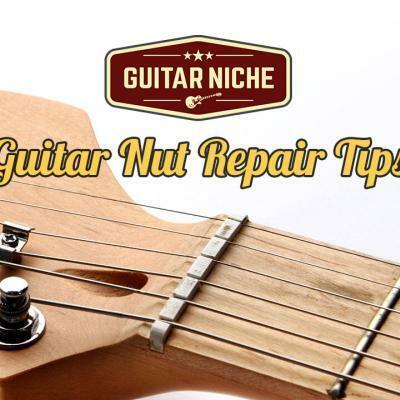 TIP: Tightening the nuts should be one of the last things you do when installing the electronics (other than pick guard screws and knobs). If the nuts are torqued down prematurely, heat from soldering can expand the the pots thus loosening them up. 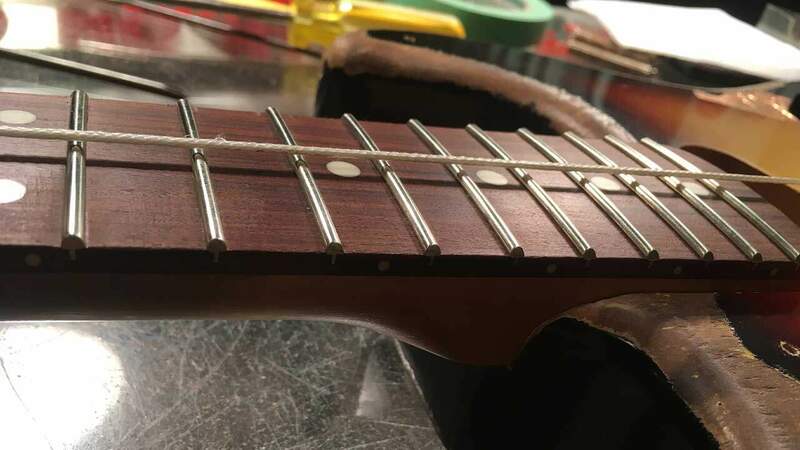 Marked the string slots on the nut starting with the outer strings (1 + 6) about 1/8″ inch in from the edge of the fretboard, then eyeballed the rest. There’s no trick to this as the human eye is remarkable at picking up discrepancies – either the spacing looks even, or it doesn’t. The nut also has excess height material to work with so I can “walk” the strings into position if I need to. Rough cut (notched) the nut slots just deep enough to hold a string in place. At this point, I’m more concerned with having a rudimentary carrier for the strings more than anything else. Installed the remaining four bridge plate screws to finish up the bridge installation. Installed the strings and snugged them up but NOT TO PITCH! That comes later. 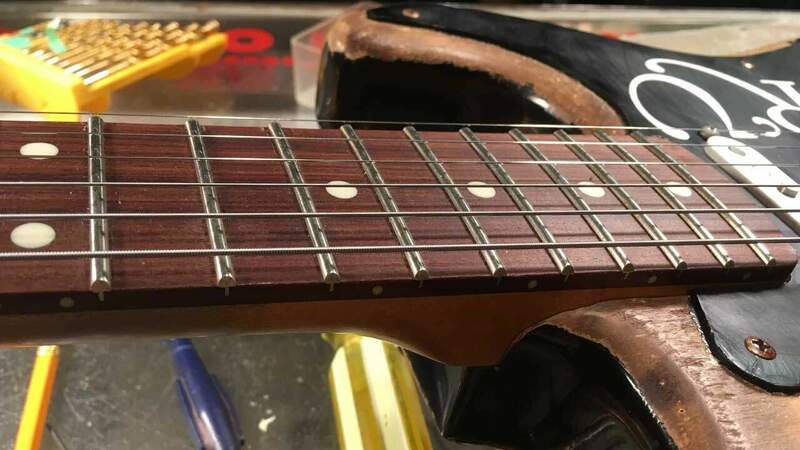 The extra wraps increase the angle over the nut which reduces string chatter and improves tone. Chances are very good that the strings won’t have to be removed entirely so the tag ends were cut off. Tweaked the string spaces on the nut slightly to make sure they looked even and were directly in line with the tuners. Taking a visual note from an original photo, marked the string tree position with an awl. Took note of string height around the fifteenth fret area. Adjusted the treble side to the width of a nickel – .077′′ or 1.95mm. Adjusted the bass side the width of two dimes – .1′′ or 2.7mm. 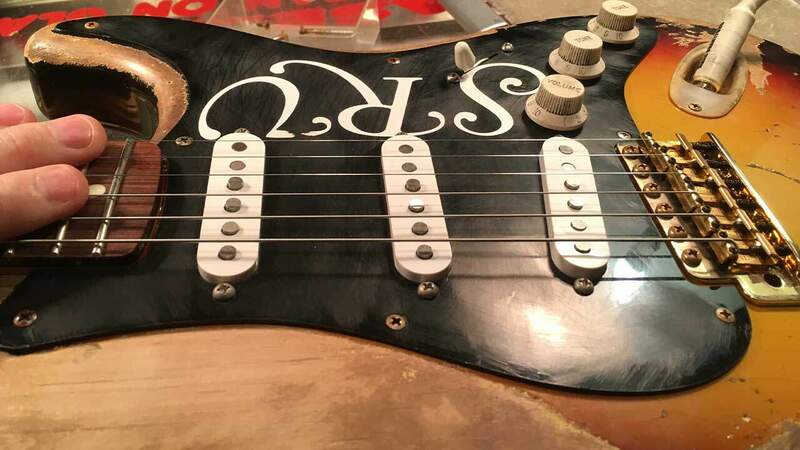 The remaining saddles were then adjusted to match this custom SRV Number One’s twelve inch fretboard radius. Cut the string slots to near final depth. The actual final cuts will be made when the strings are at pitch and the neck is under full compression. Dressed out the nut by removing excess top material, chamfering the sharp edges, and removing tool marks using fine files. The fine files are a matter of preference as they tend to provide a more positive feel compared to sandpaper. The nut will also be left with a slightly rougher finish to match the aesthetic of the guitar. Checked neck condition and lateral alignment – good. 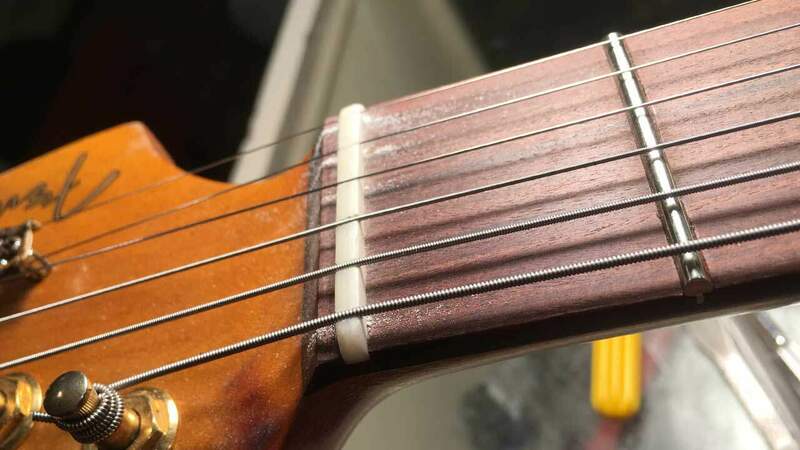 Checked string tension – just snug – good. Checked string height – good. Well within saddle height adjustability – not too high or too low. Installed two more trem springs, for a total of three, to make sure the bridge wouldn’t lift. Because these strings are 11’s they’ll have a good bit of pressure. Better to apply compression gradually, checking relief and action along the way. At one tone down, we have very slight relief as measured using the third string between the second and seventeenth frets. The strings are starting to feel a little “mushy” along the neck. This is normal – as compression takes effect, the geometry of the setup will change and the guitar will feel different. Learn to anticipate this! The bridge is still flush with the body but I know three springs will not keep it in place as we move forward. Installed the remaining two trem springs. Set the claw plate 1/2″ back from the rear wall of the spring cavity. Lowered the saddles just a touch, about one full turn per grub screw, to anticipate the increase in string height as pressure increases. Checked the string height at the nut. The little bit of relief made a big difference in slot depth. The strings are riding higher at headstock which is influencing the overall feel. This is entirely expected and part of the reason we approach a new setup in stages rather than committing to final adjustments early on. Relief looks like it’s very close to the sweet spot, but more on the straighter side. With the strings sitting proud at the nut, the slots were recut to keep the action feeling as normal as possible. Finally brought the guitar up to pitch and plugged it in to check operation. To test the SRV Strat’s electronics, my highly modified Traynor YSR-1 amp was set on “shiny dirty”. 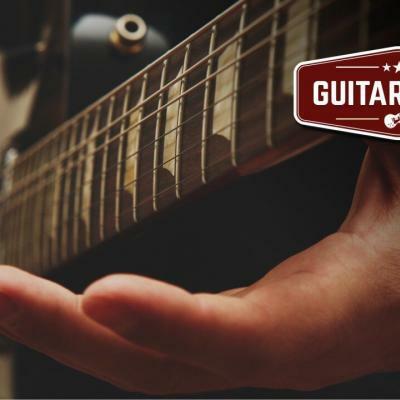 A little bit of gain helps to get a handle on the dynamics of the controls and output of the pickups. Working through the controls, the trick is to be objective, taking stock of visual cues and sonic deficiencies. Everything works but the pickups are set too low, output seems a bit light. Raised the pickups to about an eighth away from the strings and checked again. Output is waaaaay better, much more lively. The guitar’s output is dynamic and sounds like what it’s supposed to sound like, but it is horribly out of tune. Again this is a byproduct of intention as the strings have not been stretched in order to maximize their playable potential. Re-tuning the guitar up to pitch, time to check the relief again, and it looks perfect! Since I’m happy with the overall setup at this point, I gave the strings one good stretch to help them settle in and prep for intonation. If the strings are not seated at least once, they’ll be too elastic to give you stable readings, and eventually drive you mad! Double checking the overall action again, the nut slot depth is holding it’s own, string height is good, relief is good, and the guitar feels great. Each string was checked for intonation across the scale length. 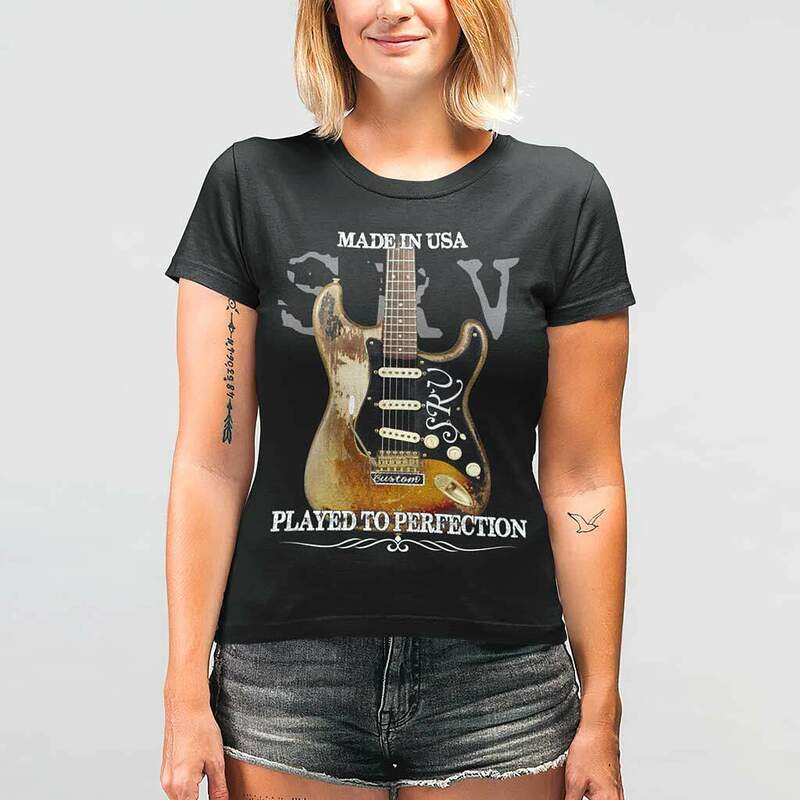 The intonation process basically involves using a fretted note near the headstock end of the neck, and cross referencing that note with it’s octave counterpart closer to the body in the upper register. The two notes must read exactly the same on the meter. If there is a discrepancy, such as the upper register reading sharp, the string needs to be lengthened to compensate. The reverse is true should the note read flat. 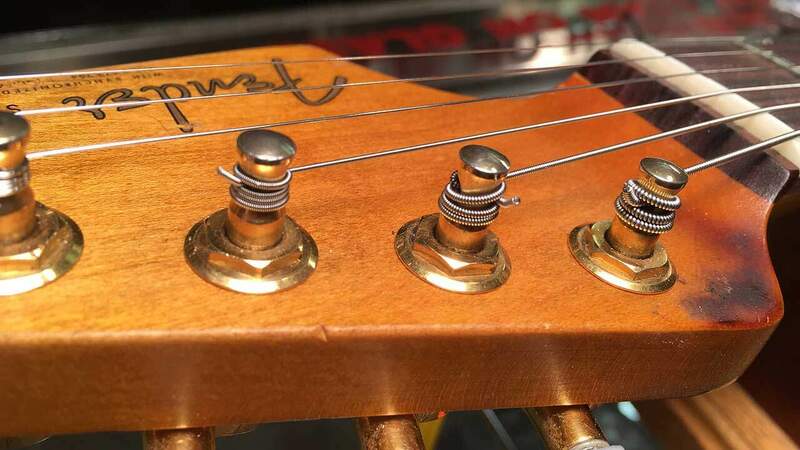 Compensation is achieved by adjusting the string’s intonation screw. While checking intonation points, the A, D, G, and B strings were found to be spot on. only two strings were off-tolerance. The hi E was a tad sharp in the upper register, and the low E was a few cents flat in the upper range as well. After adjusting the offending strings, intonation for the entire instrument was double checked for accuracy. 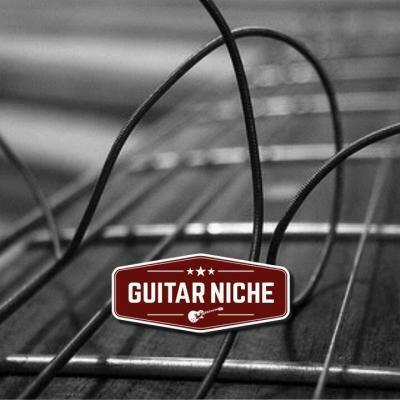 First impressions of tone – really good. 2nd and 4th positions sound killer. The Klein pickups are very sensitive to gain, very dynamic in a good way. 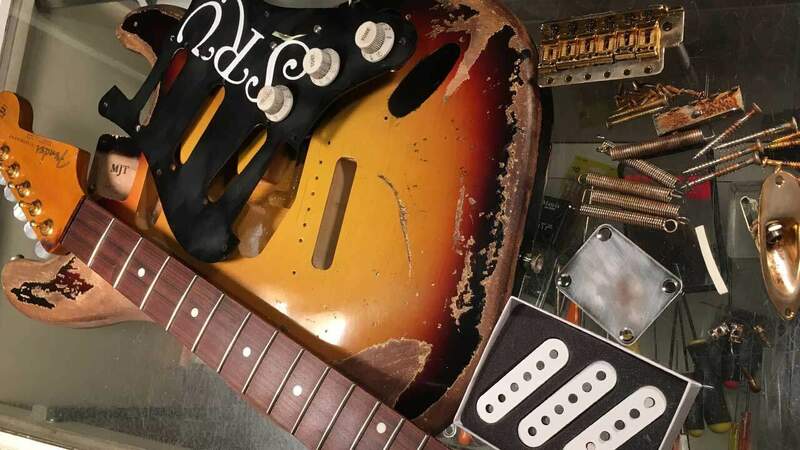 The bridge pickup comes to life with great presence and body, but the neck gets a little muddy at full tilt. By backing off the gain at the amp a little bit, it was easy to find a sweet spot where everything worked in harmony. At this point the guitar is virtually done. But I’ll go around and check the screws etc, and let it sit for a day to let pressure and compression set in. Note there are still only two neck bolts in place – for good reason. Should things go sideways for whatever reason (Murphy’s Law), I want to be able to expedite disassembly to make corrective adjustments. Check the nut for final depth and apply some lubricant if it’s set. 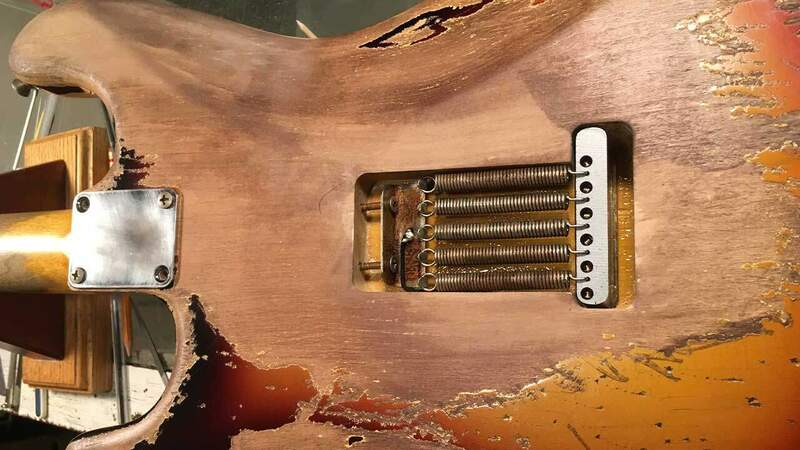 Instal the remaining neck bolts if everything is ok.
Give the strings their final stretch. 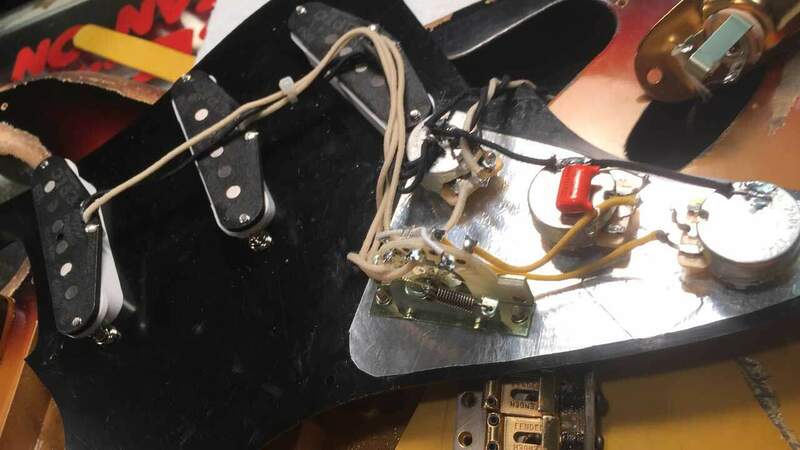 The next day I noticed compression has impacted the setup a little, not much, but enough to warrant removing the neck and make a truss rod adjustment. 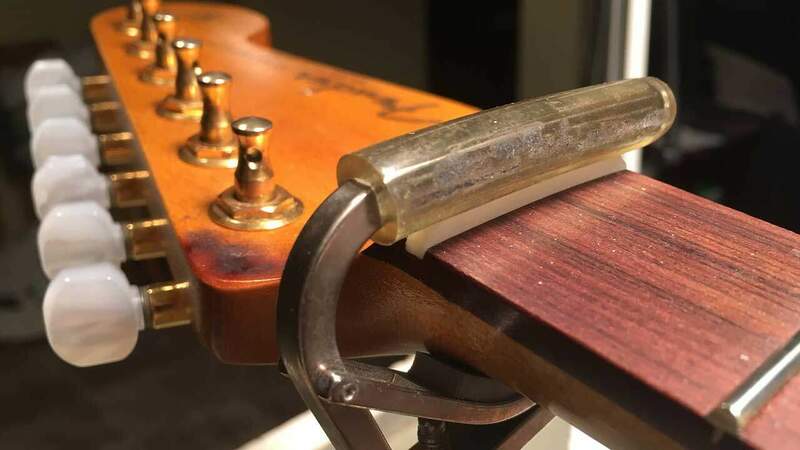 TIP: Use a capo over the nut to keep the strings corralled when you need to make adjustments like this. After removing the neck, I snugged up the truss rod about a quarter turn and felt the adjuster engage a bit better as it seated. 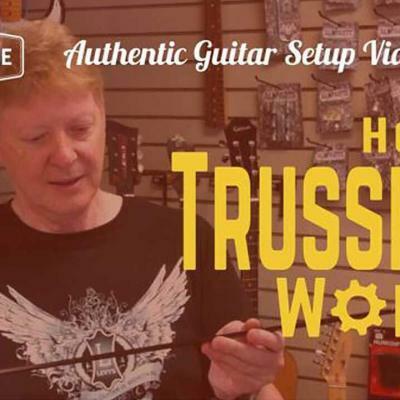 NOTE: Assuming an instrument reasonably well made from quality materials, a simple truss rod adjustment may only impart about 85% to 90% of the desired effect. That is to say, you may not see the full effect of an adjustment right away. It may take many hours, a day or two, or even weeks before the neck is fully influenced. Keeping this in mind, try to anticipate this extra movement by being a little conservative in your approach. Reattached the neck and installed all four neck bolts. As mentioned previously, this is a moment of truth. Any sketchiness in the marriage between the neck and the body will become evident once the pressure of all four bolts is in place. 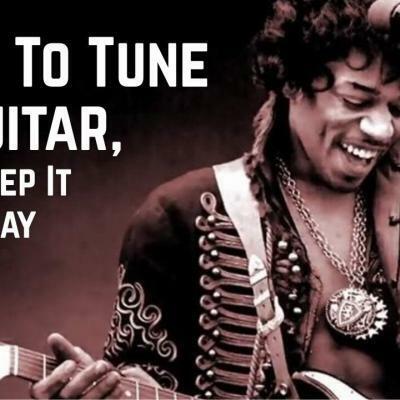 Tuned the guitar up to pitch, checked the alignment and general action again. Everything was spot on. Gave the strings a good stretch and checked the setup again – still good. Checked the nut for slot depth and operation. There was a little sizzle in the fourth string at the nut which required a little back cut to remove. Checked the nut operation again which was good to go, and applied a little lube to finish it up. The final play and sound check was very rewarding and a lot of fun. The instrument was responsive, easy to manipulate and felt very solid. Watch the Stevie Ray Vaughan Number One Strat Soundcheck Video! When I shared my opinion about the final result with the client, he informed me that he had made it a point of buying high quality parts specifically for this build. In doing so, his decision had ultimately paid off in spades! 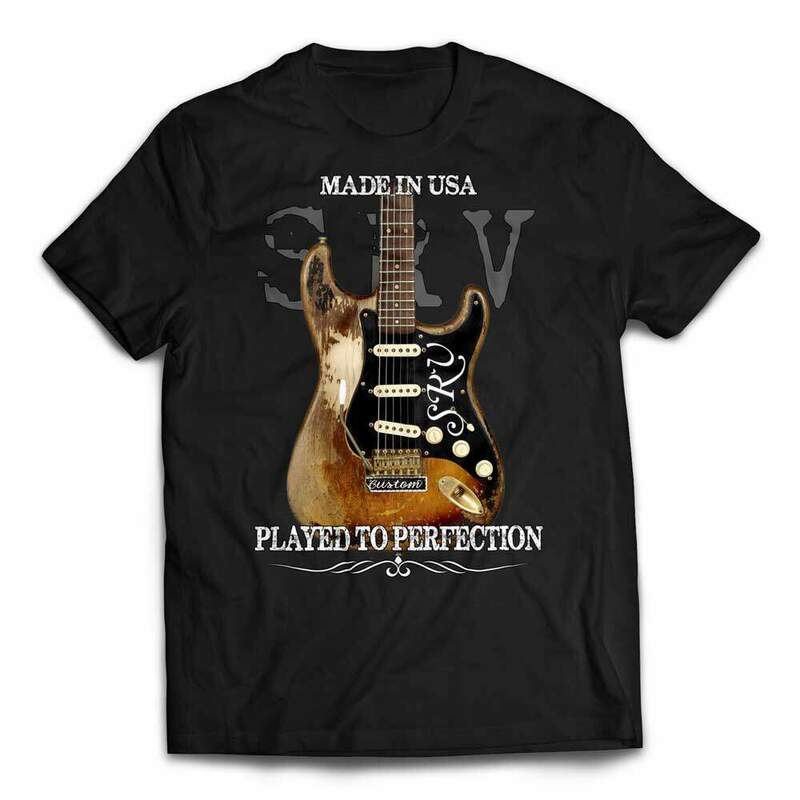 Overall, the freshly minted SRV Number One Stratocaster replica sounded and played fantastic! 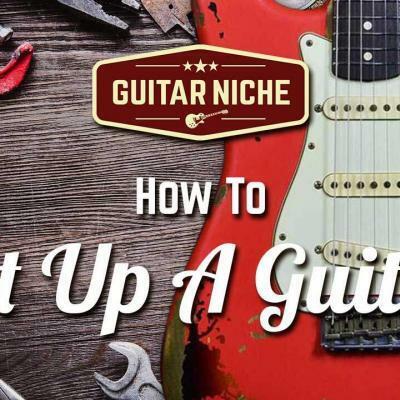 Assembling a guitar from scratch, whether for yourself or someone else, is an awesomely rewarding experience. Putting together an instrument that honours one of greatest instruments and iconic players of all time is doubly so! I hope you enjoyed this article, and perhaps picked up a nugget or two of knowledge along the way.